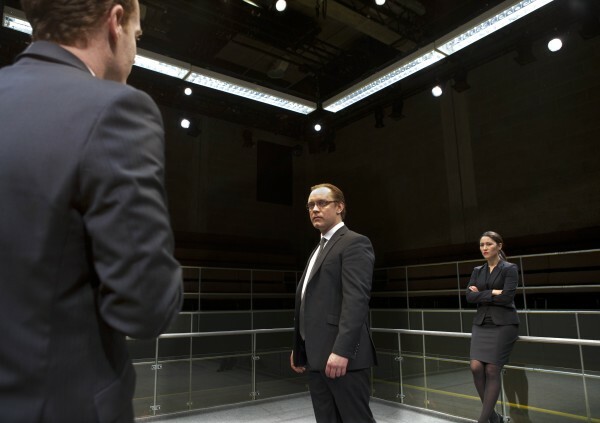 My EQView feature this week is a review of Bull, playing at the Young Vic, a new play by Mike Bartlett, exploring how nasty, brutal and toxic workplace bullying can be. Bull is a very powerful play that packs a real punch, set in the workplace and putting office politics and bullying centre stage. It makes its points well and drives home to its complicit audience just how nasty, brutal and toxic workplace bullying can be. Highly recommended. 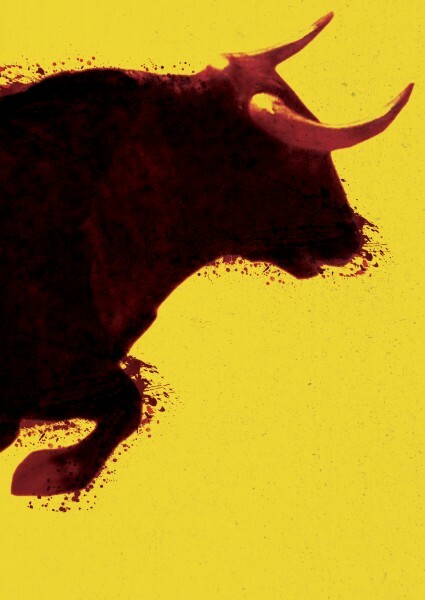 Bull is a new play by Mike Bartlett, the playwright of the moment, currently playing at the Young Vic in London, following highly successful runs in Sheffield and New York in 2013. In the age of austerity and in the midst of a recession, everyone can identify and empathise with the work situation in Bull. The play is set in the present day and we are in a workplace where job cuts are imminent. We join three colleagues (Tony, Thomas and Isobel) in a local office, gathered together awaiting an imminent visit from Carter, their boss. There is tension in the air and everyone is on edge because Carter is coming to the office to decide which of the three he will let go. The title of the play, Bull, is a very clever one as it carries several meanings. The main promotional image for the play is that of a Bull, and one of the characters, Thomas, can be seen as a Bull in a Bullring, goaded and tormented by Tony and Isobel as they set out to outwit and destroy him. Secondly, Bull directly references bullying, bullying in the workplace being one of the main themes of the play. Finally, Bull could also be referring to bullsh*t, which is what all of the characters are speaking most of the time to keep their jobs and survive the cull. Bullying is at the heart of the play. Bull focuses on the workplace and looks at how, when job cuts are imminent and the knife is about to fall, the gloves come off, the niceties go out the window, and it is every man for themselves. Over the course of a very tense 55 minutes (the total running time of the play), we witness Tony and Isobel ganging up on Thomas, teasing him, undermining him, goading him, playing on his insecurities, and taking him apart as a colleague, and as a person, piece by piece. They set out to ensure that Thomas is the one who is fired, even if this means destroying him in the process. This is brutal to watch and, as an audience member, you are complicit in what is happening on stage. One of the most innovative aspects of this play/production is the staging, which is magnificent. The stage, whilst dressed as an office complete with a water cooler!, is in the shape of a bullring or a boxing ring, and the audience surrounds the ring on all four sides,either standing (with a “ringside” standing ticket as I did), or else seated on a higher level, looking down on the fighting (physical and verbal) taking place on the stage/in the ring. The actors are up close and personal and, as an audience member, you are a bystander (present but not involved). That said, the door is open for you to be involved if you wish to participate, and some audience members did voice their feelings and make their presence felt. By staging the piece in this way, it makes every audience member, whether they choose to get involved or not, think through what they themselves would do in this situation. What could I do to stop this bullying? Would I take any action? Would I just look the other way and turn a blind eye? Is this just survival of the fittest playing itself out in the workplace? There are just four actors in the play, and they are all strong, but I wanted to give a special mention to Adam James playing Tony. Tony comes from a well to do background, is well educated and intelligent, oozes self confidence with not a shred of self-doubt, and knows how to play the game. He plays to his own strengths and exposes his opponent’s weaknesses. He will stop at nothing to climb the greasy pole, and is charming but totally ruthless. Someone who will stab you in the back, with a drink in his hand and a smile on his face. Adam James is perfect for this role and plays his part to perfection. Finally, the play ends with a coup de théâtre that is surprising and highly effective, and the play closes with an image that will stick in your mind for a long time to come. In summary, a very powerful play that packs a real punch, set in the workplace and putting office politics and bullying centre stage. It makes its points well and drives home to its complicit audience just how nasty, brutal and toxic workplace bullying can be. Highly recommended. Bull plays at the Young Vic until Saturday 14 February.